For half a second after picking up today’s IHT, I misunderstood the relationship between the top headline and the image below it. Or I wanted to misunderstand it. 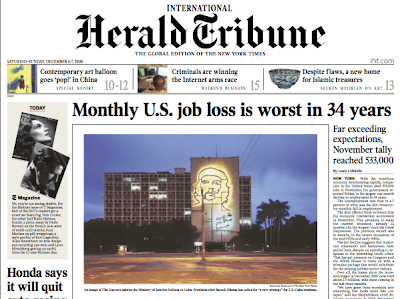 Of course the image doesn’t have to do with apartment blocks in Detroit doing Che instead of Santa and his reindeer this year but rather is an illustration for just another internally incoherent piece about Cuba and socialism (not up for link for some reason…) Still, still, thrilling when the paper gives you the chance to imagine a different sort of Saturday morning. Could almost be mistaken for a Burroughs’ cut-up newspaper collage.